Day 29 of the 30x30 challenge. I went with the olive in the capsule for Angie's Olive on Olive ensemble, using gold metallic shoes, belt and bag. 1-3: capsule items in use with taupe bag with gold hardware. 4-6: someone asked if the olive sweater was the same color as the olive jacket. This shows me wearing them together. Close, but not the same. Both EF. 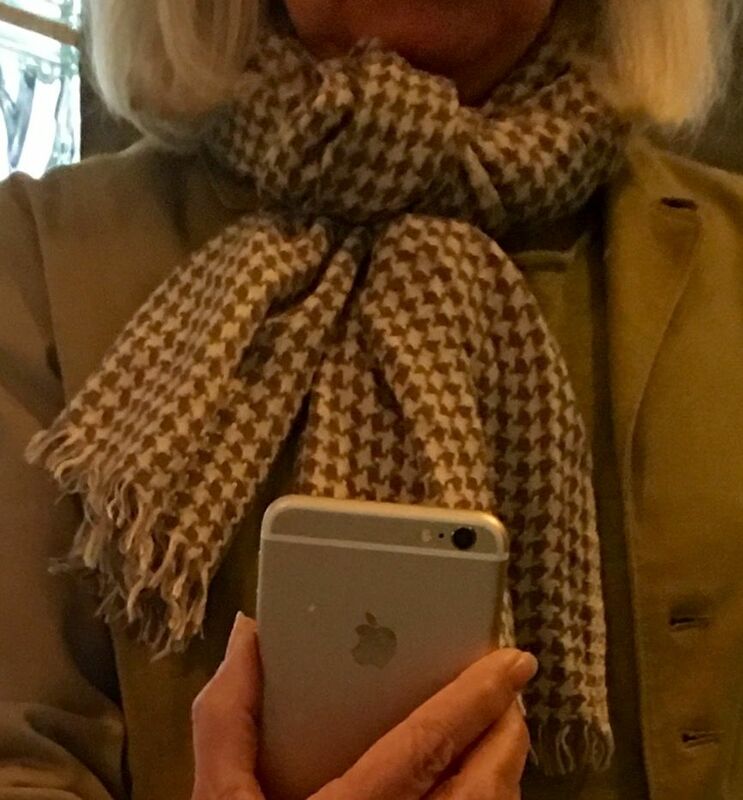 Also featuring the sweater tucked in so it did not hang below the jacket and the other scarf with lots of olive. I welcome your thoughts. You look great. The metallic shoes and parka with the white fur trim and your beautiful hair: just gorgeous! Thank you, Dauncen. The faux fur on the coat is about the same color as my hair. I really like the tonal look of combining olives in this outfit. The metallic shoes are fantastic. Thank you, Toban. I like Angie's suggestion of metallics with olive. At first I was looking for olive footwear and bags, but like the sparkle the metallic adds, so have stopped looking. The jeans are a very dark olive so look black. The first scarf pulls the various olives together, at least in my mind. I loooove the metallics with tonal olive and the bits of cream make it all the more scrumptious. Dang it, I was fine with my wardrobe not including olive but now I am having second thoughts! Great outfits - I especially like the one where you are bundled up in the parka and ready to tackle the elements! Really like the metallic with the olive! Olive love! The gold metallics are prefect and I like the bit of shine with the olive. Your first outfit is my fave, but I also really love your shorter jacket and that herringbone scarf! Very fab, Joy. I like how the sweater sleeve peeks out at the bottom of the jacket sleeve. I also really like the scarf from outfit one. Did you try the jacket outfit with that scarf? OMG. THOSE shoes!! Must buy metallic shoes post haste. Fantastically polished. I love the drape of the sweater. Gorgeous outfits as always Joy and so "you"! You are fabulous and so talented. You are a master in putting together casual and very polished and interesting outfits. I especially love the look with the scarf in the pictures 1-3. The metallic shoes and bag are great! Thank you, stylish ladies. I liked the metallic with olive. I liked the gold, but think my metal of choice would be bronze. I need to find a replacement for bronze metallic flats that I wore to shreds and am still mourning. Silver, steel and pewter are good too. I have no rose gold or copper accessories, but they would also add some shine. Tarnished copper with the soft green patina could be lovely with olive. Tanstaafl, I did not try the first scarf with the second jacket this time but have worn it in the past and like how the white is repeated in the white furry collar. The second scarf is rectangular and smaller. The first is a big square. Sterling, you need metallic shoes. At first they were out of my comfort zone style-wise, but I got over it. They don't have to scream, " I'm retired and live in Florida" if not worn with rhinestones on your specs or back jeans pockets. The first outfit is KILLER fab. Love the silver bookending. Thank you, Angie! You made my day! All fab, but my fave is nr 3 where fur on the hood and silver metallics on the shoes bookend your gorgeous hair! I also love the citron in the scarf for another accent! Super cool! Thank you, Elizabeth and lyn67. I learn so much from you. Day 30: today I pulled out some items from the capsule that had not had quite as much wear. I also wanted to be able to change easily into the bone skirt outfit for dinner out tonight. I ended up with the EF white/bone jeans, pale grey cashmere sweater, red vest, black polkadot scarf and silver sneakers, watch and bag. I will post outfit photos later from my phone. The outfit had a higher happiness factor than expected. I wore it to a book club and running errands. I had started with my silver loafers but realized they were too slippery for ice and snow patches in parking lots, therefore the sneakers. It is good to have easy options. Is this a pass os fail? Suggestions for improvement? This was not my first 30x30 challenge. From the first one I learned that I need variety, but know I can working from a very small suitcase for months if needed, although I may never want to wear those clothes again. This time I did something different. I wanted to learn more about my need for variety and especially color during this time of the year. I had put aside in my closet what I thought my 30 pieces would be based on past mid-winters but chose at the last minute to add as I went along. That changed things a lot. I decided to just count tops, bottoms and indoor toppers, not accessories footwear, outdoor toppers, under layers just for warmth, or bags. I often thought that this was cheating on my part and came in with 27 or 28 pieces in the end. *I learned that I had bottlenecks with some items in the laundry when I needed them. I could use multiple basic white/ off-white tops and black tops, and another pair of black pants and white jeans in a winter capsule. *I decided that my only winter trousers (white) will be donated and a topper ( taupe) is going to a holding zone. I am no longer happy with it but it may work for lounge wear or a gardening topper on a cool day. *I learned that I wanted to wear more patterned pieces, although patterned scarves were a big help. I wanted to wear my 2 pair of patterned jeans. (They were not in the capsule and did not seem versatile enough to add. The two patterned tops that were included got reached for often. I may want to add more winter patterned tops. * I learned that I really wanted to wear my sweater dresses, which I did not include but should have. I could not decide on one or two as there are four or five. *I wanted badly to wear some of my "cold spring" things but resisted because I want them to seem fresh in February and March and beyond. Last year we had cold and snow in mid May. I did wear the light bone neutral and some pale grey in the capsule. * I wanted to add more texture like my furry vest. I should have put it in the capsule as an indoor topper. * I found that I was very happy with vests. * I liked low and high contrast equally. Joy, your day 30 outfit is a pass with flying colors. Yay for the happiness factor! Your musings are very thoughtful. You made the most of this challenge and have identified many needs. Maybe you should make a sweater dress challenge because selfishly, I would really like to see how you style them! I have to come back to read you musings. So excited. The olive colors aren’t showing well for me but u agree, the outfit proportions of #1 are fab— live the sweater untucked with the slim pants, & the metallic shoes are great. Second, SO glad you got the olive jacket with fur collar. It looks made for you. Outfit #30 is most definitely NOT a fail, it's wonderful! The only thing I would suggest is that the black scarf is a little heavy for the rest of the outfit. I think it would be better if you had black echoed somewhere else. But better yet, another scarf with bone, red and/or the metallic colour in it. I'm sure you have something! Maybe even the one from #1 Day 29? Or the Burberry? So hard to tell colours online. Will read your musings later. Hi Joy, sorry I got a little behind with my reading and answering. Your day 30 outfit is great! It is fresh and elegant and the red vest suits you very well. I will have read your musings later, still at work. I look forward to it and will be back. It sounds like you learned a lot, Joy! Your comments about saving items for "cold spring" really resonated with me because I am thinking hard about how to add more seasonality to my wardrobe (when I can and do wear the same items year 'round). Also, I'm impressed by how brave you are with fashion and how you found yourself craving more pattern-both tops and bottoms--that's an inspiration to me. I love the metallic shoes with your olive outfit, Joy--they really have impact. And you look beautiful in your winter jacket. In response to your Challenge musings... I've tried to move into a "cold spring" capsule the last few years beginning in March, and it just doesn't work. No matter how much my mind wills the temperatures to be warmer, it stays very cold here well into April. In response, I've intentionally increased my "bleak midwinter" capsule because I know I'll be wearing it for many months. You did a fabulous job with this challenge. You have presented such an interesting variety of outfits which looked great while keeping you warm and being appropriate for your varied activities. No one outside of YLFers would have guessed you were limiting your closet numbers. So interesting to read you challenge musings Joy. It seems you have learnt a lot of interesting things about your wardrobe preferences and needs. It sounds like this exercise has been very useful to you. For me, the challenge is the first one ever - everything is new. How you, ladies, work with these challenges, your individual goals and rules, as well as the conclusions you arrive at is so inspiring. Joy, I love the combination of olive and metallics. The earthiness of olive and the sparkle of the metallic is so lovely together. I agree that bronze would be a wonderful metallic. I am searching for bronze sandals. I do have copper ones. Thank you all for your support and thoughts. Style Fan, if you find bronze footwear, let us know. Katerina, each challenge brings new insights. I should add that I also discovered that I desperately need a better way to store scarves so I can find them more easily. Right now they are mostly in plastic shoe boxes by major color with the most useful for the season on a clip hanger hung with that color in the closet. Joy, I have enjoyed all of your postings during this challenge, you have a wonderful style. Sounds like you had some great learnings with this challenge. I am another who discovered that patterned pieces need to play a big role in my wardrobe- or at least statement tops do. Your musings are fascinating. It is these recaps that make my day at the end of the challenge. I need to know that we all learned something valuable to us. I was surprised that you encountered bottlenecks, but I do one load of wash (either light or dark) nearly every single day. So I just plain forget that bottlenecks are a thing. Will you be shopping for multiple basic white/ off-white tops and black tops and/or another pair of black pants and white jeans? It seems clear to me you would benefit. And you too found a couple of items to either donate or retire. What an unexpected benefit that was for me. Interesting about the patterns and sweater dresses and contrast. I noticed you are continuing challenges into February. Good luck. I'll watch for posts. Sterling, I also do s load of laundry nearly every day, but with just two of us it takes longer to get a load of like color clothing. Today was sheets and bedding day. I ended up adding towels too, yesterday was regular wash darks (socks, dark towels, napkins and such. I put in a few dark clothing items that could take that cycle ( men's jeans). I do more hand wash some weeks. I also hand almost all of my things to air dry. Even in our dry climate it can take a couple of days, especially if hung in a cold garage. I think I have enough black and white tops, but just did not want too many duplicates in the capsule taking up valuable space. I can have two pair of black jeans in rotation if I count the Hoxie's which were not in the capsule. They are a lighter weight than most of my jeans so not always best for mid winter but could be winterized by layering underneath. I also have some black ponte pants. White jeans.. I would like a higher rise but that may make them too warm in summer. I learned that I need to be sure I have enough of these items. I also learned that I desperately need to edit out more or do seasonal storage so that I can find items I want to wear easily. Scarves the the biggest challenge as are wooly socks and keeping pairs together. I look forward to seeing your sweater dresses as well as your fur vest. I think sometimes texture can take the place of pattern in a deep winter wardrobe in interesting ways.